Flowing double flutter sleeves allow the young performer to move her arms with ease while playing her instrument. The shallow v-neck is very modest and age appropriate. 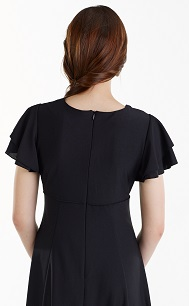 The neck line comes up to the neck bone in the back of the dress. The Youth Corelli dress is made in our wrinkle resistant crepe fabric that is excellent for traveling choirs and orchestras. The gown has an empire waist and a back zipper. Machine Washable. FWO Extras: Now, both adult and youth choir or orchestra members can wear the same great gown. Check out the Adult Corelli Dress if you love this style but need it in an Adult size.